My kids spent their summer vacation having Nerf wars, playing Fortnite, and generally living their best lives. I spent my summer, learning AI, learning AI, and learning some more AI. 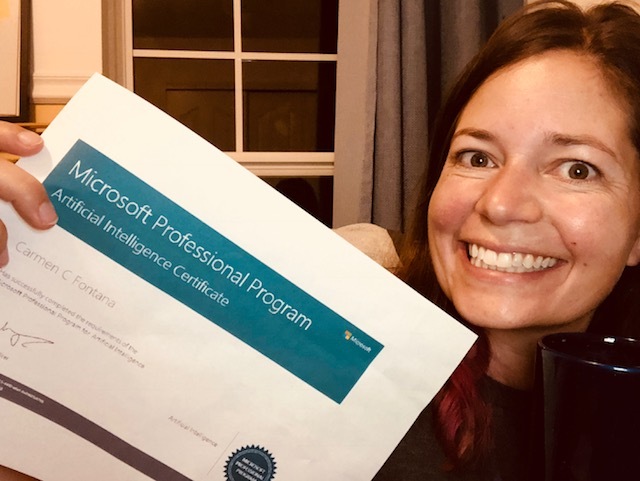 My goal was to complete the Microsoft Professional Program in Artificial Intelligence before the buses were rolling at the end of the summer. As you can see from the cheesy accompanying picture, mission accomplished. 1. It’s a ten-course program, through edX. You will cover a wide range of topics from Python, to Ethics, to Natural Language Processing. 2. I spent about an hour a day, M-F, on the program. This worked out to be about 2-4 weeks per class. So it’s doable, but you can’t finish it overnight either. 3. Anyone can take the classes, but having a math and programming background really helps. 4. This is a new program, released just this past spring. So, unfortunately, no accompanying Microsoft AI certification as of yet. 5. If you want to learn about AI, whether a little or a lot, I highly recommend this program!